The mineral fluorite is famous for its glassy luster. It has a wide range of colours but maily purples and greens and colourless. Named after the Latin word "to flow". Natural freshwater pearls are cultured by the fish farmers in China. Mainly hosted by mussel shells the farmers take small pieces of live tissue from one shell and insert it into another where it continues to grow until the fishermen harvest the crop. Natural freshwater pearls come in various shapes and sizes. 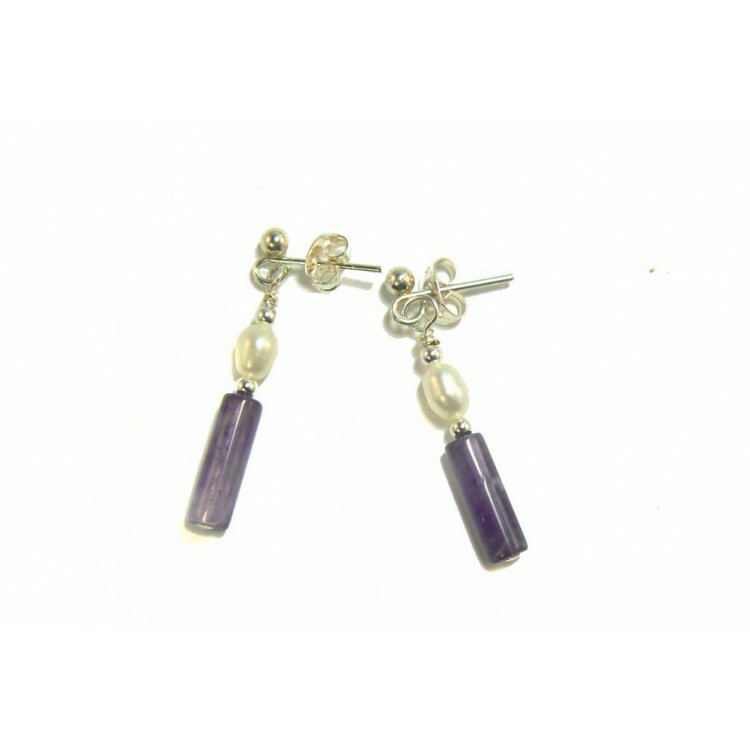 An ideal gift for that special person, I have finely crafted these delicate Fluorite and Pearl earrings, using fluorite tube beads and tiny rice shaped freshwater pearls. Perfect for wearing for a night out with friends, or even just as enchanting with a clerical suit. They have been made with silver plated "nickel free" earring posts and scrolls to comply with EU directives.